About a year ago I was at whiskeymilitia.com looking to see what their latest deal was and it happened to be a Nixon watch called the Fidelity. Most Nixon watches are pretty expensive, high-end watches, but this particular watch is one of the cheaper ones Nixon makes. The Fidelity costs around $50, but Whiskey Militia was selling them for just $15. I couldn’t decide on a color and ended up buying two of them. They have turned out to be my favorite watches I’ve ever owned. The Fidelity is a very simple digital watch. It has all the basic features you would expect from your basic digital watch such as time, date, chrono, and alarm. The Fidelity case is made of a custom 100-meter polycarbonate with hardened mineral crystal and a stainless steel case back. 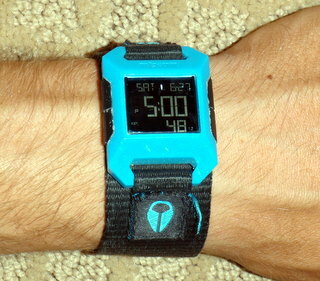 The band is a nylon strap with a buckle. It is small and comfortable, and best of all, a good surf watch. It reminds me very much of the old Shark watches I used to have as a kid. I have owned other Nixon watches before such as The Player, and The Ticket. The high-end Nixon watches are no good for surfing. They are just simply too nice to take into the ocean and expose them to the hazards of surfing, even if some of them are waterproof. The Fidelity is a perfect surf watch. I have not taken this watch off for almost a year now. I surf in it every single day, in all kinds of conditions, and this watch is still ticking. It fits nicely under my wetsuit sleeves, never posing a problem when changing in and out of my wetsuit. 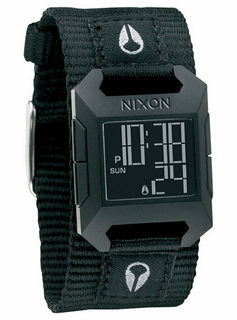 Lastly, I think this Nixon watch looks pretty stylish considering how cheap it is.